If you regularly shoot videos with your DSLR camera but curse the fact that you can’t pan easily or move/freeze/move without jerking, this article is for you. Our comparison of the best gimbal stabilizers for DSLRs covers a range of equipment with both simple and complex stabilization features. Your investment will likewise vary depending on how much you expect this gear to do. An important difference to keep in mind when you review gimbal-type systems is that you will find single gimbals, 3-axis models with three focal planes of gimbal action, and vest or harness-based operator-attached designs. For the advanced professional videographer, you might prefer a Steadicam® brand model, which is outside the scope of our comparison because of their specialized use. Other manufacturers offer the same operator-attached feature, depth of capabilities and broad range of functions, and those are the ones we’ve included here. Calling this a dual grip by itself can be deceiving, since it’s easy to morph this framework into so much more. The kit includes low placement handlebars that can function as a ground or body brace, a top carrying handle for low angle shooting, and a flexible turning stand to accommodate all sorts of 3-axis movements. Note that some kits also come with the carrying case and other accessories such as a 360-degree rotation mount. This unit is small enough to fit easily in a camera backpack. Unpacking and fastening on the handles is a simple twist on process. Balancing is also quick to achieve with the system adjusting your settings in record time. The rechargeable Ronin polymer battery is proprietary, and some customers have reported problems with either charging it or with the gimbal recognizing it. Reviewers note that it is easier for experienced gimbal users to manage than the novice. Poor customer service is a frequently-mentioned issue. This gimbal is designed for use by a solo operator or by a team for more complex shots. The ability to manage the camera in tilt and pan settings as an operator or with an assistant makes for unique video opportunities. 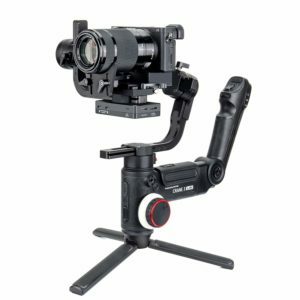 Because it can accommodate a broad range of heavier cameras and lenses, this gimbal has many uses across a range of shooting situations. Note that you can add numerous accessories from third-party manufacturers. 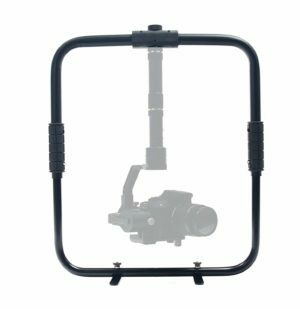 These include a harness or vest to which your gimbal can attach (like a Steadicam®), and a tripod mount system for easy attachment when you release the sled with the camera. All in all, this makes it the best all around, user-friendly system on our list. This single grip 3-axis gimbal gives you control and then some, with multiple planes of focus to make action shots easy to capture. Achieving stability and slow panning is also a breeze with the assistance of camera monitoring as the gimbal works its magic. An included mini-tripod adds a breadth of uses to this handheld unit. If you’re in motion and so is your subject, the Focus Follow system exceeds others in its class, keeping your images stable and smooth. It interrelates to a number of camera brands through kit-included cables. It also monitors your camera’s performance and provides a read out through its built-in OLED screen. Some users complain about problems balancing their cameras on this gimbal, even with prior experience. Out-of-balance situations lead to excessive motor noise as the system attempts to work. Three rechargeable lithium ion batteries (included) run up to 18 hours on 5% power, but only an hour at full power. Download the smartphone or computer apps to add more depth to your control. Everything from the kit fits into a carrying case for work on the road. Add an aftermarket vest or change to dual grip and you’ll be as close to a Steadicam as you can get. 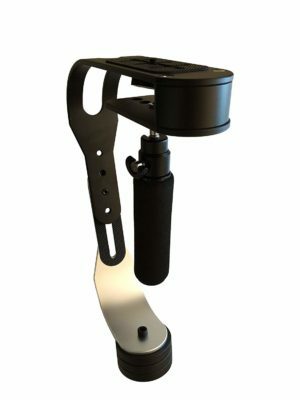 This entry-level unit is not an automated gimbal but a mechanical single grip gimbal stabilizer. An adjustable plate where your camera mounts allows you to balance weight while releasing your camera quickly when needed. The arm is also extendable from 15 to 24 inches to add even more finesse to those adjustments. Users love the versatility of this gear. It’s easy to add other attachments like lighting, microphone, and other peripherals on the fly and make a fast adjustment to the plate or arm length to return to balance. The unit comes with a carrying case as well. This gimbal raises mixed feelings in some users who say it does not balance as well as they had hoped. Videos are not smooth as a result, and the unit is almost too simple. The grip may not be as grippy as you would hope, and the quick release plate also needs a little more effort than what you might think. Reviewers like this unit for its affordable price tag and good basic, results. Make sure you practice with it before any important shoots, because it does take some getting used to. It’s been great for artsy videos and for more professional looks as well. 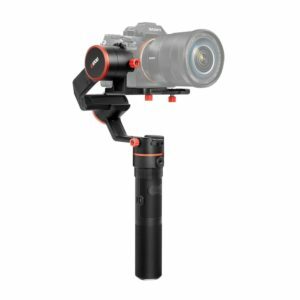 This gimbal is something of a chameleon, since you can use it as a single grip handheld, dual grip handheld, and vest unit. It comes with a neck strap that offers steadier control without using a formal harness system too. This versatility makes it a choice of aspiring professionals who focus their creative attention on high quality videos and longer filming shoots. The stabilizer is easy to balance and simple to reconfigure depending on your shooting requirements. Its 3-axis system provides 360-degree rotation to capture unusual angles. It comes with a hard sided carrying case for those videographers with a need for durability when they travel. Users note proprietary lithium ion batteries are expensive to replace. Balance has been an issue for some people to manage. The lower load capacity disappoints some. While this isn’t as robust a system as a Steadicam®, it can be a good foray into semi-pro work for the serious enthusiast. Some note that it is the same as a Zhiyun, which is not technically true, but it does use the same smartphone app for camera control. This gimbal stabilizer is a good stepping stone without investing in what’s required to go fully pro. 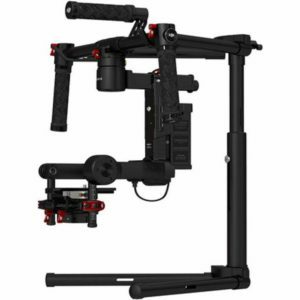 Many gimbals rely on mechanical counterweights to maintain the balance in their systems. This unit sets itself apart by relying on electronic technology with settings through a Bluetooth connection to manage the balance for you. Its design ensures that you won’t find the system blocking your view of key readouts on your camera as you work. Not only is balancing easy, but this frame will work with a variety of peripherals, including tripod mounts. Changing from single to dual grips is a fast process, as well as low and high level shooting. The technology automates panning, tilting and rolling processes tool for precise time lapse photography. This stabilizer has a lower weight capacity, which means it will only function for smaller DSLRs. Some reviewers experienced problems with the motors not balancing as they should and/or with excessive motor noise heard over their videos. 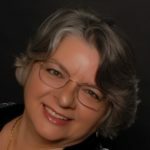 Because it relies on computer software to run the motors, it is important to update the firmware before taking any other action to avoid it running amuck and damaging its motors. Users note the sturdy build and durability of this unit as a big plus. The learning curve with balancing is well worth the results, and once you learn it, you’ll see what a benefit it is. Coming complete with its own carrying case, this may well be the last gimbal you need if you’re a videographer who wants discreet but reliable equipment. This is much more than a budget-friendly single axis gimbal, great for those of us who don’t want to worry about battery life. If you work in tight spaces or need to move without a lot of clutter, its small profile accommodates you. Its single grip and handheld flexibility help you avoid shake without causing fatigue to your arm. Besides DSLRs, you can use GoPros, compact cameras and even smartphones (with an adapter purchased separately) on the flexible mounting. Three counterweights are adjustable and let you select exactly what will work best, offering you balance no matter what you put on the mount. It relies on a single gimbal in the handle to shift as you do, and it does not need batteries. The single biggest downside is the low capacity limit on how much your camera plus lens can weigh. If you add a shotgun mic to the mix, you’re pressing your luck. In this case, color also matters, as the ‘black’ version has a bigger grip and more sway control. This unit earns high praise for its construction, durability and quality. We also recommend it for kids because of its easy set-up, appropriate size, and flexibility. If you have a budding videographer in your house, encourage them to step up to their next level with the addition of this handheld gimbal. Camera stabilizers come in many forms. Gimbals are mechanisms that allow the camera to move while remaining focally fixed on the subject, making them great for videography. Steadicams® are a brand of gimbal. Tripods, monopods and other fixed stabilizers fall under a third category, those used generally to shoot still images. While all fall under the broad stabilizer umbrella, gimbals serve a unique niche for the videographer. If you’re shooting to post on social media, the right artistic effects can make your work stand out without making it look like the effort of an amateur. If you’re a professional photographer preparing corporate videos or an indie documentarian, you want to tell the story without distracting movements that don’t fit the subject. Technically, a stabilizer in the DSLR world is any piece of equipment that controls unwanted movement while capturing still or video imaging. This can be as simple as a bean bag sitting on a fence or rock, but that’s a little too simple for what we’re discussing here. Here we’ll all about action. While you could shoot a video rotating your DSLR on a bean bag, the fixed nature of the location limits what you can do with it. You can turn from side to side and perhaps tilt up or down, but if your subject moves further away, following it means you’ll need to pick up that camera. That’s a prime opportunity for camera shake, resulting in amateurish jitters on the video. Gimbals date back to ancient mariner times, when a set of interlocking rings kept a compass level in rolling seas. Fast forward to the needs of today’s videographer, and you find the same type of mechanism repurposed to keep a camera level while focused on a moving subject. The DSLR can then pivot around an axis point so the lens stays trained on the subject no matter what kind of pretzel position the videographer/operator needs to be in. Imagine having your camera mounted on a handle that rolls, allowing your camera to stay level while you dip under tree limbs or climb over rocks. That’s what a gimbal does. They come as single plane (single axis) systems which can only move on one dimensional plane, and 3-axis for all three dimensions, each moving independently while maintaining the center steady. Gimbals are great for car chases, but they also work well for work with drones and as handhelds. The gimbal compensates for vibrations and shakes, even while it follows panning, tilting or intentional movement. They can also be mounted on long focal length lenses to follow moving wildlife or sports action. A Steadicam® (the name is proprietary) is a person-mounted device that holds the camera’s aim steady via a gimbal system. The videographer (operator) can move and the arm of the Steadicam® absorbs the vibrations from focal adjustments, jerks of movement or general terrain jitters. While gimbals can be handheld, Steadicam® operators wear a vest with the equipment attached. A big advantage in using a Steadicam® type of set-up is overall balance. The center of gravity is stable even when the operator is in motion, and when things are set up correctly, no hands are required to keep focused on the subject target. While a gimbal buffers the camera from unwanted movements, the operator controls the overall balance of all equipment, light or heavy. Remember that Steadicam® is a brand, not a piece of equipment per se. You can find gimbals on the market that use harnesses or vests, dual grip mounts and other Steadicam® features, but they can’t technically call themselves Steadicams® (even though some of them do). If you want the same functionality, look for a high-end 3-axis gimbal with a harness or vest system for operator body attachment. DJI Ronin-M V3 3-Axis Gimbal A A 5.00 lbs. 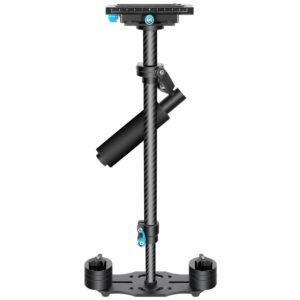 Zhiyun-Tech Crane 3 LAB Handheld Stabilizer A A 10.14 lbs. Neewer 24″/60cm Handheld Stabilizer B+ A- 4.55 lbs. Glide Gear Geranos VII 3 Axis Gyro Motorized Stabilizer A- A 9.45 lbs. FeiyuTech a2000 3-Axis Gimbal Stabilizer A A 9.48 lbs. ROXANT PRO Video Camera Stabilizer A- B- 2.51 lbs. As you might imagine, price goes up with complexity when you’re talking about these complex stabilizers. Smaller equipment is also only good for lighter DSLR body and lens combos. If you’re using a full frame body with battery grip plus a zoom lens, considering your total gear weight is important. Another aspect of selection is size of the gimbal. The smallest single grip can easily fold to fit into your gear bag. The larger dual grips require their own case. If traveling is part of your videography routine, consider how much size matters. At a bare minimum, you will want a handheld unit that has the features and maneuverability necessary to improve the quality of your style of shooting. The grip should be easy to use and balancing the unit once your camera is on board should not be a painful process. Practice walking and shooting so you understand what it’s capable of long before important video work. From this point on, anything you add is a plus, even if you aren’t yet sure how to operationalize it. If you have different DSLRs, you want to make sure it accommodates different body sizes and types. The type of battery and battery life for the gimbals is also important. If you have different video needs or are shooting in varying styles, you’ll want equipment versatile enough to meet the range of needs. As you can imagine, the greater the complexity, the higher the price tag, but that doesn’t mean there aren’t specific-use models at a lower cost. You might need more than one if variation is something you need. Is the swivel head on a tripod a gimbal? Can I attach a gimbal to a tripod? Can you add a harness or vest to a regular gimbal? Can gimbals be used for still photography? Can gimbals be used for time-lapse photography? How difficult is it to balance a gimbal? How does drop time effect the balance of my stabilizer? Can gimbals only be used standing up? Gimbal stabilizers shine in videography. That’s not to say there aren’t other uses, but in those cases, these assistive devices are overkill for most photographers. If you’re curious about the best uses or common facts, check out our FAQs below. DJI Ronin-M V3 3-Axis Gimbal Best overall 8 lbs. 5-6 hours 5.00 lbs. Zhiyun-Tech Crane 3 LAB Handheld Stabilizer Best for solo videographer 7 lbs. 1-18 hours 10.14 lbs. Neewer 24″/60cm Handheld Stabilizer Best entry level 6.6 lbs. N/A 4.55 lbs. Glide Gear Geranos VII 3 Axis Gyro Motorized Stabilizer Best for aspiring professionals 4 lbs. 8 hours 9.45 lbs. FeiyuTech a2000 3-Axis Gimbal Stabilizer Best for electronic control 5.5 lbs. 12 hours 9.48 lbs. ROXANT PRO Video Camera Stabilizer Best for budget-minded 2.1 lbs. N/A 2.51 lbs. No, the swivel head is just that, a swivel point. It cannot remain level and focused on the subject if you move it while filming. It is fixed, not active, and therefore isn’t classified as a gimbal stabilizer. There are third-party attachment systems that allow you to quickly move your camera from your gimbal to your tripod, but the whole gimbal does not generally attach. It would defeat the purpose as the operator uses a gimbal to stabilize focus on the subject when moving. Gimbal stabilizers are intended for tracking movement while moving. Vest and harnesses to turn your gimbal stabilizer into something like a Steadicam® are manufactured by third parties. You’ll want to consider the total weight you want to carry, the fit with your gimbal system, and how well it adapts to your controls. Some harnesses and vests can interfere with settings, block the ability to adjust your gear, and restrict your movement, so shop wisely. If you really need to have the operator wear the stabilizer to capture the kinds of videos you want, you’d be best off thinking seriously about buying a Steadicam® as your solution. Yes, you can cobble something else together, but it may not work as well as starting with the system designed for this use. You might end up paying as much or more by the time you’re done too. You certainly can use them for still images, but the question would be why. A tripod or monopod offer you the ability to hold the camera steady when mounted. New attachments for the mount screw allow you to add a device that tilts in a flat plane, such as holding the camera facing down and extended out from the tripod. A gimbal could be useful if you’re planning to shoot a fixed subject, then begin moving around that subject. You would probably need an assistant in this case, since you still need to aim, frame, and adjust your settings for each shot. A remote shutter release may then also be a necessity. If you think of time-lapse photography as a super slow motion version of videography, it makes sense to use a gimbal stabilizer to capture the shots. This is particularly important if you’re using a slow shutter speed, like astrophotography. This only makes sense, though, if you need to track your subject while moving rather than remain still and capture how much your subject moves over time. All stabilizer manufacturers claim it is ‘simple’ and ‘fast’ to balance their unit, and in some cases, that is true. Laws of physics tell us balance is a function of distance to the pivot point from each end, distance between the counterweight and the camera plus lens plus mount, and how much weight is at either end. This means your first step is understanding the weight of your camera plus lens. Manufacturers have recommendations on balancing process from that point onward. Some want you to adjust the distance from the pivot point, and others recommend adjusting your counterweights next. In theory, making sure you have the same weight at each end would seem to work, but the bulk distribution and dimensions of the camera also come into play around the pivot point. In reality, this will be something of a trial and error process as you master balancing. That means putting your camera set-up on your stabilizer and seeing how well you can move with the camera remaining level. You also want to adjust the balance for drop time, noted below. Drop time is the amount of time it takes your stabilizer to come back to level based on how much weight you have on the top (camera plus everything else) and the bottom (counterweights). If it’s too fast, your videos may still have evidence of shakes. A windy day could move your camera then too, and you may have a significant bounce when things do level out. If it’s too slow, it means your axis point doesn’t adjust fast enough. That means you could be moving one way while the camera end is still adjusting for your previous framing. It can also throw your grip out of balance as you unconsciously try to compensate for the slow down. According to professionals, the target drop time (called the ‘butter zone’) is 1 1/2 to 2 1/2 seconds. Lift the counterweight end to be perpendicular to the ground and let it go, counting the seconds as it falls to reach vertical. You’ll find the place you like best and can adjust your counterweights to find that balance. Imagine the kinds of images of action you’ll capture from a low shooting level while still avoiding shake and rolling. If you can switch to upright without changing the counterweight adjustments, you add a whole new angle to your videos. Some gimbal stabilizers can reverse their weighting system, with the camera on the bottom and the counterweights on the top. While this might seem to be an over-the-top mode, consider being able to move through small openings while shooting, something a number of the gimbals on our list offer to you. You can also wiggle through a cave, examine the scene from a low level position, and shoot while laying on a rock or platform. If interesting angles are something you use extensively, consider how well the gimbal stabilizer matches your contortions. Consider one way to classify gimbal stabilizers as how you hold it. You have single grip (handheld), dual grip (two hands), and harness or vest / shoulder mount (on operator body). Harness or vest mounts can be added to single or dual grip as well. Past this, your criteria for selection focus on how easy the unit is to use and its ability to do the job you call for. Some are single axis only, and others have a full three dimensional 3-axis system. Here are the criteria we’re noting to help in your selection process. DJI Ronin-M V3 3-Axis Gimbal Best overall A A A- 8 lbs. 5-6 hours 5.00 lbs. Zhiyun-Tech Crane 3 LAB Handheld Stabilizer Best for solo videographer A A A- 7 lbs. 1-18 hours 10.14 lbs. Neewer 24″/60cm Handheld Stabilizer Best entry level B+ A- B+ 6.6 lbs. N/A 4.55 lbs. Glide Gear Geranos VII 3 Axis Gyro Motorized Stabilizer Best for aspiring professionals A- A A- 4 lbs. 8 hours 9.45 lbs. FeiyuTech a2000 3-Axis Gimbal Stabilizer Best for electronic control A A A- 5.5 lbs. 12 hours 9.48 lbs. ROXANT PRO Video Camera Stabilizer Best for budget-minded A- B- A- 2.1 lbs. N/A 2.51 lbs. Balance refers to the ability to control the movement adjustments of the camera when you’re in motion. It is a function of the stabilizer system design, weight of the camera plus what is on the top, and the counterweights on the bottom. If it is easy to adjust this and develop/maintain balance, the stabilizer earns an A grade. The more versatile a stabilizer, the more likely it will fit in your required shooting conditions. To earn an A grade, a stabilizer should be able to function in a variety of settings based on its size and weight, as well as up your game for more complex shooting requirements. The ability to convert between single and double grip is also a plus. Some stabilizers have a reputation for being hard to balance. Others require you execute a steep learning curve to get it to function properly. If it’s easy to set up and easy to learn how to maneuver, it earns an A grade from us. The load capacity is the total weight the upper mount of the stabilizer can bear. This includes the camera, lens (if interchangeable) and peripherals like mounted microphones. This indicates the maximum amount the counterweights can compensate for in the unit. The more complex stabilizer systems often come with an LCD screen to allow the videographer to see what the camera does, even at strange angles. Some 3-axis models also need battery power to run the gimbals. We note the battery life in the criterion and any other facts like type of special battery in the text comments. Stabilizers are going to be held by you, and as such, you want to know what they weigh as a base before you add your equipment. When appropriate, the weight listed includes monitor and battery pack. Harness mounts are not included in the calculation.